The goal of hospice is to minimize pain so that patients are comfortable and able to enjoy each day to the fullest. Hospice of the Upstate has an unmatched expertise in pain management whether that be in your own home or at our Rainey Hospice House. Hospice may be the right choice if you or your loved one has illness with a prognosis of less than six months and have chosen to receive comfort care as opposed to curative treatment. What this simply means is shifting the focus from curing a disease to maximizing the comfort, dignity and care of the individual. 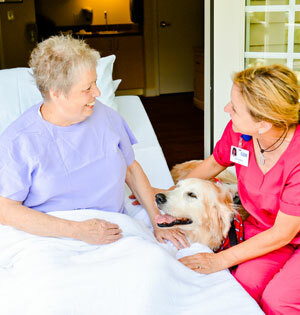 Hospice of the Upstate will address not only your physical needs but your emotional and spiritual needs as well. We involve the patient and their family in all decisions and provide you with a comprehensive Care Team available 24 hours a day, 7 days a week. How do you start hospice care? While patients must have a doctor’s referral to receive hospice care, the patient, family and friends can initiate the process by calling Hospice of the Upstate at 864-224-3358. If you’re not sure how to begin a conversation about hospice with a loved one, here are a few ideas. Medicare, Medicaid and most private insurance plans provide hospice coverage. If coverage is not available, staff will help research other resources for the family. Aren’t all hospices the same? Although each hospice must meet basic requirements of service before they can be licensed, Hospice of the Upstate offers many services that set us apart. Hospice of the Upstate is a community supported, not-for-profit hospice. Our patients have the Rainey Hospice House when receiving care at home is not the best option. Hospice of the Upstate also has an extensive bereavement program, the caregiver is followed for 13 months after the death of a loved one, receiving time appropriate grief literature. Grief support groups are offered during the day and in the evening to best suit the needs of all family members. We believe that community education is very important. Hospice of the Upstate provides programs about end-of-life issues to churches, workplaces and organizations. Our Faith in Action volunteers keep us connected to the faith community. Recognizing the importance of spirituality in end of life, we employ three chaplains who are available to minister to our patients. Hospice staffs are up-to-date on the latest medications and approaches for pain management and symptom relief; they also recognize emotional and spiritual pain is just as real. With hospice care, many patients can be as alert and comfortable as they desire. What happens when a patient improves or lives longer than six months? It is not unusual for a patient to improve after admission to hospice. It the patient’s overall condition stabilizes, they may be discharged and readmitted at a later date if needed. If a patient continues to be eligible for hospice, services may continue longer than six months. Does hospice mean I have to sign a DNR? Having a Do Not Resuscitate order (DNR) in place is not a requirement to receive hospice care. Can patients keep their same doctors and medicines? Hospice reinforces the patient-physician relationship and the physician becomes a part of the hospice team, contributing to the hospice plan of care. Patients can still opt to see their physician in his office as long as they are physically able. Once physically unable to make visits to the physician’s office, our medical staff keeps in contact with their physician, updating him/her and requesting changes as needed to best manage symptoms. Hospice of the Upstate Home Care Medical Director is available for consultation for home care patients. The Medical Director for the Rainey Hospice House manages all aspects of care of patients in the Rainey Hospice House. Patients’ medicines are reviewed at time of admission. The patient, family and doctor work together to determine which medicines are medically indicated and tolerated. Medications related to the admitting diagnosis are provided by Hospice of the Upstate including medications for symptom management. Who will be caring for my loved one? An experienced team of Doctors, Nurses, Nursing Assistants, Social Workers, Chaplains and Counselors create a plan of care according to the individual needs and wishes of each patient. A variety of grief groups as well as caregiver support are offered to hospice families and community members. Can’t find the answer to your question? Ask us.